Lunch: I packed a lunch for Maddy and Owen and fed Cora before we left. They love a packed lunch as long as it involves tiny snack bags and cheese sticks. And eating on the road eats up a bit of traveling time. Backpacks: Maddy, Owen, and Cora all have backpacks that they take on long car trips. Inside I put a bunch of books (new and exciting ones–different than the ones that are always in our car), a tablet and their pack of crayons, a bag of stickers, and some small toys. Electronics: We (gulp again!) also don’t have a Leapster yet or any of those small Leapfrog toys, so I packed Maddy’s mp3 player and Owen’s Little Einsteins computer. They used them solo for a while then switched. 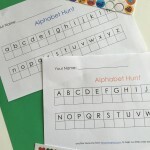 Games/ Activities: In each backpack, I put a blank ABC Hunt and a Number Hunt Card (same concept but with numbers 1-20). I clipped a few sheets of stickers to each card so that when we decided to play, the stickers were right there. Small Magna Doodles: I bought mini Magna Doodles when I saw them for next to nothing in some post-holiday sales. Sometimes if Maddy, Owen, and Cora have them in the car, we take turns calling out a letter or an object (ball, apple, sunshine, etc.) and have everyone draw it, or we play guess the letter or object and we have the kiddos take turns trying to stump everyone. Of course, it’s easier for Maddy and Owen, but at least Cora’s trying. 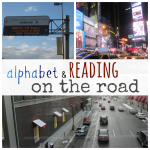 . .
ABC Tablets: On small tablets that we had sitting around the house, I wrote each letter of the alphabet at the top of the first 26 pages. Then I wrote the numbers 1-10 on the next 10 pages. Once all of my other resources had expired, I had Maddy and Owen take out these tablets and draw a picture of something that began with the letter on the page (“apple” under A, “ball” under B, etc.). Or, if they wanted, they could find a sticker to put under the letter or write a word they knew that began with that letter. On the number pages, they could put that number of stickers underneath or draw the designated number of balls, hearts, smiley faces, etc. They really, really liked this but only made it through a few of the pages. Fun for the ride home! Travel is never easy, but when I plan ahead just a tiny bit and have activities for when they need them, it helps make the ride more enjoyable for everyone. And a small stash of lollipops always helps ease the pain when tiny passengers get antsy! What we didn’t use on the ride yesterday will definitely help the ride home go more smoothly tomorrow. Happy Travels! We’ve also linked to this post in ours on field trips slated for April 24th.